Ceramic rimsherd is an example of Adena Plain pottery. It was part of a fairly large jar with a slightly outward bending rim and a flat lip. The surface is plain with no decoration. It is very pale brown and dark gray in color. Item was excavated from Cowan Creek Mound in Vernon Township, Clinton County, Ohio. The Cowan Creek Mound was a conical burial mound located in Vernon Township, Clinton County, Ohio. Ohio Historical Society archaeologist Raymond Baby excavated the mound in the late 1940s. At the base of the mound, he uncovered a circular pattern of postmolds 45 feet in diameter. He found many small, thick fragments of charred bark around the postmolds and concluded that these features represented an ancient house that had been roofed with bark. This was the first discovery of a circular pattern of postmolds beneath a mound in Ohio. 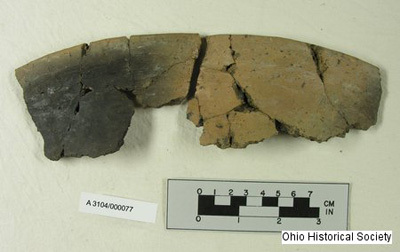 A radiocarbon date for the site indicated it was built at around 440 BC, placing it squarely within the archaeological designation for pre-contact American Indian peoples known as the Adena culture.